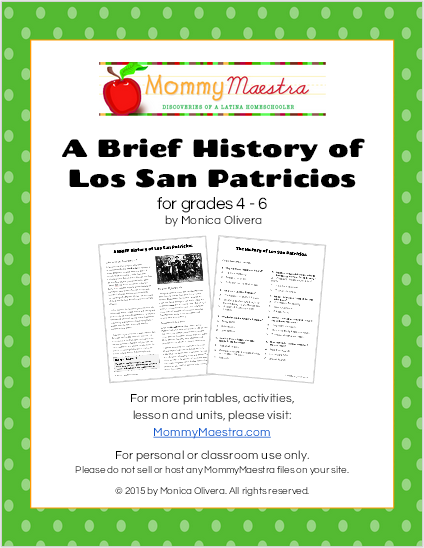 Mommy Maestra: Who Were Los San Patricios? Tomorrow is Saint Patrick's Day. And that got me to thinking this weekend about the influence that the Irish have had on Latin America's history. So I decided to put together this fast one-page reading passage about one group in particular: Los San Patricios. Do you know their story? If not, you should run over to my TpT shop and download your copy! It will be free today and tomorrow only. The file includes a one-page history of the Batallón de San Patricio, and then an 8-question comprehension quiz plus answer key. It is best used with strong readers in 4th through 6th grade. This is a good introduction to the topic and does not go into great depth - perfect for a short history lesson! If you download it, please leave some feedback. If I get enough responses, I'll consider making more of these free for a short time to MM readers. UPDATE: Now in ENGLISH AND SPANISH! Mommymaestra, Thanks for the FREE download, but don't see the link to download for FREE, it's showing still for $1.50. I would like a copy of this for my kids. Sorry, Mireya. This post was written last year!